As many will know, the UK has a fantastic tradition of singing as boy and girl choristers in the churches and cathedrals up and down the country, a privilege that a number of Tenebrae were lucky enough to experience as youngsters. One of my fondest memories from that time is of a tour to the US, not too dissimilar to this one. My parents had given me a small amount of pocket money with which to buy myself a present whilst I was away, and I ended up using it to buy a Pittsburgh Penguins t-shirt. This was my first, and until now, only experience of the city: a shirt emblazoned with toothless, angry, ice hockey-playing penguins. My only hope was that this wouldn’t be a portent of Tenebrae’s current visit. As we landed in a torrent of snow, my fears appeared not unfounded: a penguin would not have been out of place in such weather. Luckily though, no one lost any teeth and everyone seemed fairly sanguine. The Antarctic weather continued into our first full day, though that didn’t put some off going to the Andy Warhol museum or enjoying Pittsburgh’s excellent restaurants. 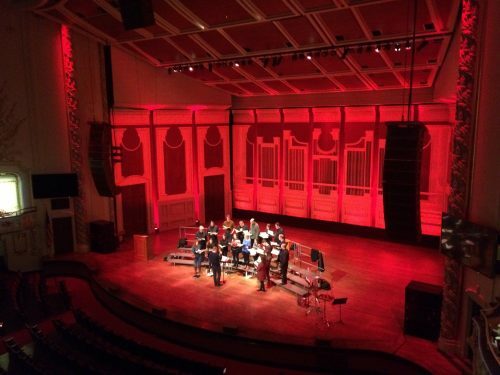 One often hopes for a low-pressure concert to start tours like these, but singing in Heinz Hall (one of the East coast’s premier concert venues) for the American Choral Director’s Association made this unlikely. If anything is to cause ice hockey-style fisticuffs on such a trip, it is high pressure! As fully expected, however, Tenebrae rose to the challenge, and it’s nigh on impossible to sing Joby Talbot’s Path of Miracles without ending with a feeling of hugest calm, satisfaction and emotional fulfillment. And so now on to St Louis, but our visit to Pittsburgh was luckily unhaunted by angry penguins. And as far as I know, everybody still has all their teeth.